← Photo of the Week: The Seattle Great Wheel. I’ve traveled a lot over the years by car, plane, train and on foot. Never exclusively by water. Never via a cruise ship. 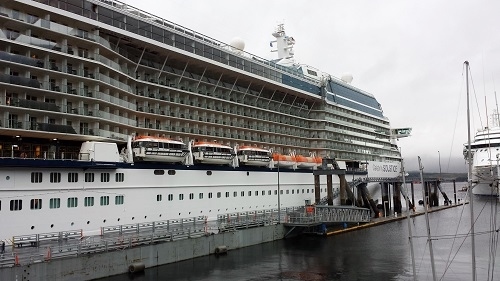 A new experience was in store for both my fiance and I as we got ready to go on a Celebrity Alaskan Cruise. There were a few things, concerns if you will, going through my head beforehand. I love being out on the open road traveling, being able to venture as far or as short a distance as I desire. How I would feel being so-called “trapped” in a small area, with water all around, for two days at a time? Once on the cruise ship, I started walking and exploring going in a given direction until I met railings outside or a dead-end inside. I had the confined feeling. 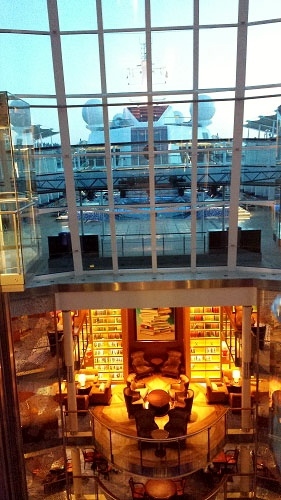 As time went on though I realized with the width of the cruise ship and the number of decks, there was more than enough things to checkout. With a library, multiple pools, bars, a theater and casino, an outside lawn and more, there was lots of exploration possibilities. 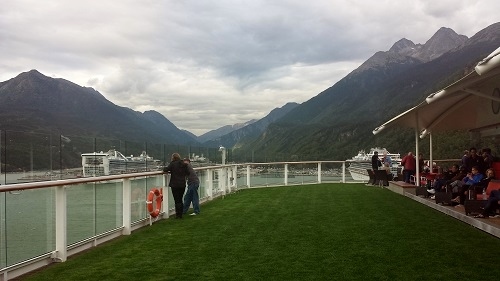 Being on an Alaskan cruise and going through the Inside Passage we were pretty close to land at all times so every time you looked the landscape and water were different and always spectacular. I thought to myself, I wasn’t trapped. 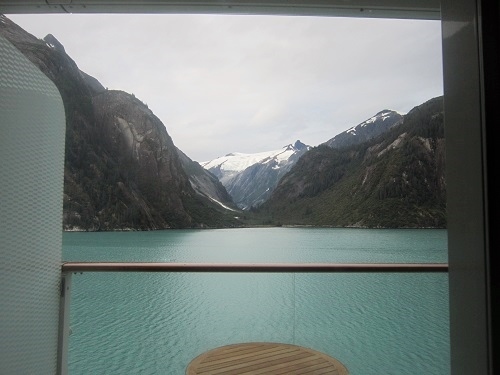 There is the Tracy Arm Fjord right in front of us from our concierge room and the mountains from an outside deck with Skagway straight ahead. 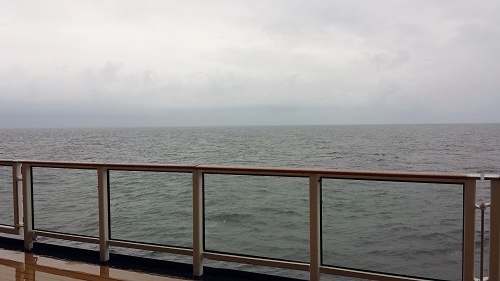 Another concern was the weather and the waves and the possible motion sickness as a result. Throughout the week-long cruise I noticed a lot of people wearing wrist bands and patches by the ear to help combat the motion sickness. Not packing enough was at the forefront of my thoughts too. Swimming, the excursions, having to pack for all seasons and the formal dinners and functions on the ship all lead to what if I forget to pack something. It turned out to be warmer than usual so a lot of the heavier clothes never got used. The rain jacket turned out to be my best friend, when it was cooler, raining or just damp like at the Sawyer Glacier. While on the cruise ship you could hangout and enjoy everything at your own pace, even more than I realized. What about the formal dinners and other functions? The timing of those was somewhat loose and if you felt like getting soft-serve ice cream and random assortments of food for dinner wearing shorts and flip-flops, you could have at it. There were plenty of shops on the ship and at the ports of call in case something was really needed. Now on the silly side before the trip I was thinking about what I was going to do about my morning coffee. The excursions and ports of call fun were thought out ahead of time so I knew that there were coffee opportunities off the ship. What was on the cruise ship was more of mystery until we got on it. The first morning put the biggest smile on my face when I read the ships daily newsletter and saw that they had a grind of the day at a coffee shop on board, Café al Bacio! A lot of the worries and concerns I had beforehand turned out to be an afterthought as the cruise got going. The Alaskan Cruise was an amazing experience for the both of us and next time I can just say, “No worries!”. What things or concerns were on your mind before your first cruise? 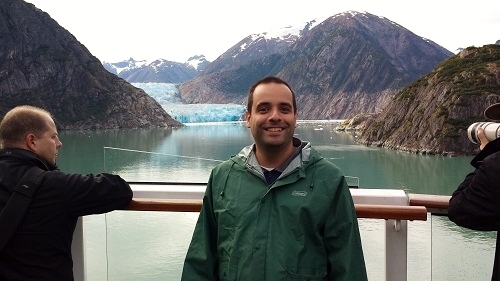 This entry was posted in Alaska, coffee, coffeehouse, cruise, travel and tagged Alaska, Alaskan cruise, celebrity cruise, cruise, cruise ship, glacier, sawyer glacier, Skagway, tips, travel. Bookmark the permalink. We were never too far off land and two days was the longest without docking so the feeling of being trapped never really came out once on board. If took a cruise from say California to Hawaii, I might think differently. I’m sure will try down the road! 🙂 Thank you! Coffee yeay! I have nothing to compare it to yet, but she’s a beauty. Well kept up, great staff and lots of fun stuff to do! I also was never on a cruise ship bevor. Andre, I guess, I never will be. But it’s interesting to read from your experience, that the movies like Dreamship or Love Boat are true in case of the opportunities on the cruise ship. Hope you do have a chance to go on a cruise someday! Couldn’t believe all the possibilities for entertainment and relaxation. There were shows, events and food/drink opportunities available continuously. As a child I was under a boat as a result of an accidet. I always try to avoid to enter any ship. Cruising is such a great way to travel – unpack once and see lots of different places. Getting there is as much fun as being there on these floating resorts. Definitely enjoyed the aspect of not having to worry about packing/unpacking for a week once aboard. 🙂 :Lots of fun going from port to port and at the ports themselves! Amazing they had a pools, bars, a casino, a theater, and of course all that wonderful scenery. I can imagine how that could keep one busy. Good coffee is also a big plus.